Brilliant musicians who had previously played my music in other contexts separately came together to play my Oboe Quartet at Penn last Friday. Oboist Peggy Pearson, who commissioned the piece, collaborated with members of the Daedalus Quartet, the quartet-in-residence at Penn. The result was superb, richly shaded, strongly shaped. The premiere of an oboe quintet by my Penn colleague Anna Weesner, the intensely strange Janáček first quartet, and a Haydn quartet arranged with oboe substituting for one of the violins rounded out the program. Anna’s piece was wonderfully varied and imaginative. She conjures memorable musical images that sound the way life feels. Peggy’s playing here, as throughout the evening, was extraordinary for her ability to subtly blend with the strings. This was held at the Liberty Hotel, which served as a jail until surprisingly recently. The next morning I went to Emmanuel Church, looking in on John Harbison before the service as he rehearsed a Victoria motet and a movement from his own And Mary Stood. It was great to have another chance to hear Anna’s quintet, plus the Haydn from Friday. The Winsor program closed with the Brahms Clarinet Quintet, with clarinetist Rane Moore joining the Daedalus in a powerful rendition of this profoundly melancholy piece. Thank you to all these musicians for your beautiful performances! I look forward to coming back to Boston for a Winsor Music concert next season that will feature a performance of my recently completed Quintet for oboe, violin, viola, cello and piano. 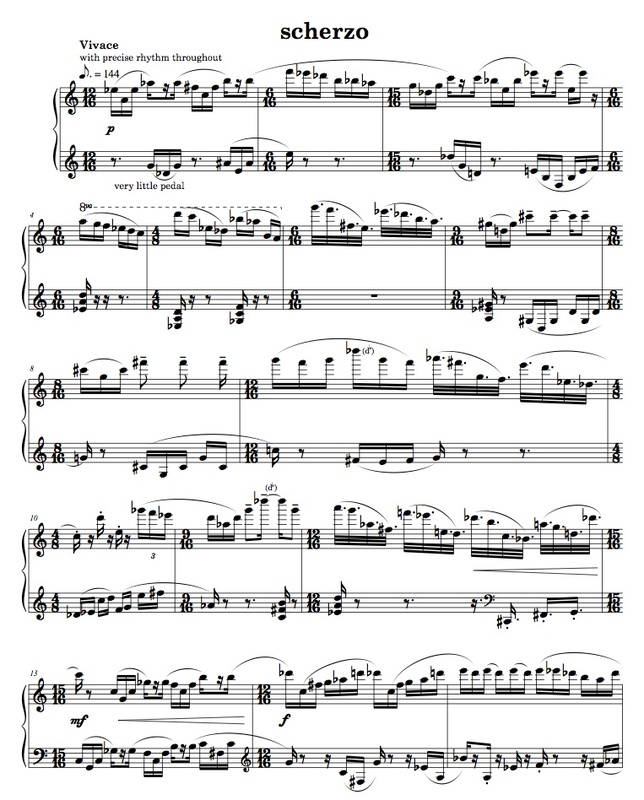 As with the previous fragment, this still needs some editing of the notation, but it will give you a little taste of the piece. Will comment on it in another post. I want to replace the tired name “Scherzo”, but no idea yet what it might eventually get called. – If you like words (hey, you’re reading something, so I guess that might include you), you might find these as interesting as I do. -regarding some Boston friends: Cantata Singers is offering Bach, Brahms, Zelenka, Marjorie Merryman, and James MacMillan, among others during the coming season. In addition to the usual Bach Cantatas, Emmanuel Music is doing the Bach Christmas Oratorio, and the Boston premiere of Harbison’s The Great Gatsby. I assume this will be done in the recent “pocket version” that Jacques Desjardins re-orchestrated, rather than the original version done at the Met. -Here in Philly, Orchestra 2001 is offering an all-Cage program and a collaboration with Pifarro, the Renaissance Wind Band this coming season. I have written elsewhere about the problem of the second performance – the difficulty of getting a piece performed more than once. Now there is an article on the Chorus America website about the issue, with a few intriguing observations, most notably Libby Larsen‘s comments about how repeat performances seem to come more easily in the realm of choral music than instrumental. My own experience doesn’t quite bear that out. I have been lucky to get my choral music performed by fine groups, and my Denise Levertov cantata, Fire-Memory/River-Memory, has been done twice by its commissioning organization, Philadelphia’s Mendelssohn Club – in fact, a recording of their second performance of the piece has recently come out. But only one of my half dozen or so motets has been done by a group other than the one it was written for. (All but one were composed for Emmanuel Music, with the exception being performed at St. Jean Baptiste Church in NYC.) Matins, my Cantata Singers commission, awaits a second performance. Yes, I’ve been lucky, but I’d like a little more luck, please. What to do? Well, for a start, a listing of my choral music, with score samples and audio clips, is here. – Lots happening for Stacy Garrop this month, including premiere performances by the SUNY Stony Brook Contemporary Chamber Players at Stony Brook (Nov. 10) and in NYC at Symphony Space (Nov. 11). – Michael Gordon‘s remarkable Timber (written about previously here, with a link to video) will be played by Mantra Percussion at the Crane Arts Center in Philadelphia on Friday November 11 at 8:00. 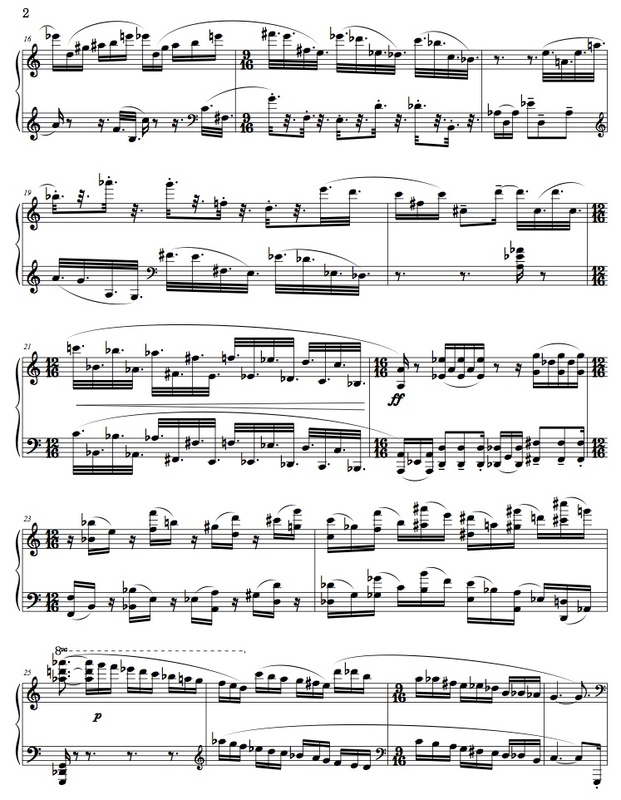 The evening-length work is scored for 6 2X4s – talk about Music for Pieces of Wood! – Music of Stephen Hartke is featured on the next Cantata Singers concert, Friday. November 4. in Boston’s Jordan Hall. The sublime oboist Peggy Pearson is soloist.